...I was blessed with even more insistent rain for the majority of the days. A few periods where the impending clouds held the flood gates loosely closed gave me the opportunity to remove my rain jacket and that’s about it. I stayed soaked through to the bone. Bumping into a few local cows helped to lift my spirits marginally as I was reminded they too have to put up with it all day and night. There's something to be said about shared suffering; it blunts the most uncomfortable moments ever so slightly. Catching the cheap €4 euro ferry from Breskens to Vlissingen was one step closer to my host and more importantly, a warm shower and clean dry clothes. I don’t mean imply that the hosting experience is nothing but a cleaning and accommodation service, but when you’re really on your back foot and having a bad day it’s about all the thoughts you can summon. Once you have had the shower you're back to your cheery old self and can think beyond those simple necessities. The ride along the docks in Vlissingen turned into quite the spectacle as I passed yachts which I could easily imagine costing in excess of $50m USD - maybe even $100m USD! I've never been shopping for one but I'll let you know a more exact estimate when I do. Staying with Fourke and Paul, my warmshowers hosts, for a few days was an entertaining experience. Fourke, with her perceptive and laid back demeanor and Paul as a tall and lanky friendly character; I was sure I would enjoy my time there. On my arrival Fourke and I farewelled two fellow couchsurfers who had stayed with her the night before. They were French hitchhikers who were hoping to hitch a ride that day to their next host in Rotterdam. I was blown away with just how little, bordering non-existent, their clothing was to deal with the constant rain. No rain jackets or pants, no waterproof cover for their backpacks, no tent . Nothing. I even thought it bordered dangerous to not have anything of that nature but Fourke reminded me they didn’t have the need for rain gear like I do. They hitchhike in dry, warm cars and sleep in homes sheltered from all the dreary weather that I have to endure. None the less, I was still impressed with their lack of rain gear. Exploring Vlissingen with it’s coastal sea breeze, it reminded me of walking the beach back home in the coastal town I grew up in. Vlissingen, being one of the gateways to Antwerp which is a European logistics mega hub, has an endless stream of cargo tankers floating by. Endless would be an understatement! 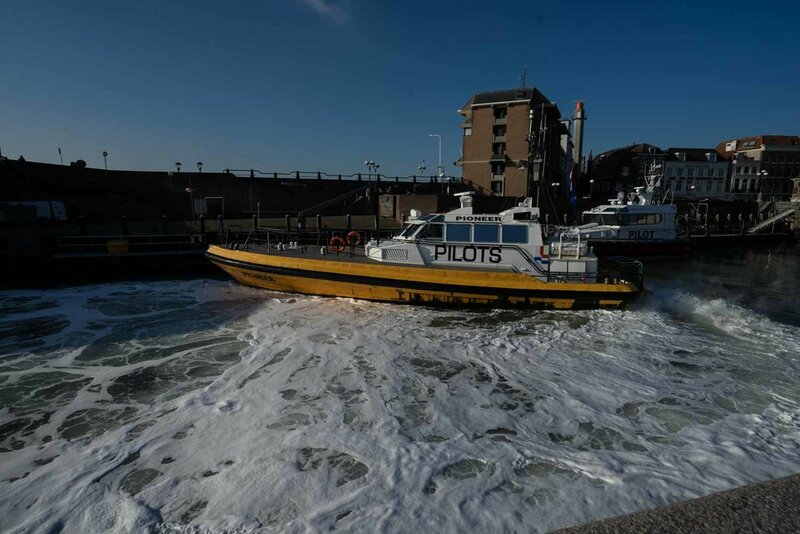 To guide these tankers safely through the channel, a fleet of busy pilot boats can be seen assisting the tankers before docking back in Vlissingen. Even the simple life boat docking maneuver is a feet to behold, with the engines in overcharge as they swing the boat 180 degrees on the spot. Nights with Fourke and Paul were spent cooking all kinds of leafy healthy meals. Fourke’s cooking skills were impressive and I gladly obliged to her cooking commands to get the meal ready. With friends over and music blasting out of the speakers, we danced (well they did) and had one hell of a night. They were also so kind to hand me a pair of token riders socks to take on my journey. I have a few photo ideas on when to whip them out but I’ll keep that on the down low till the time is right. On the bike again, I did a loop slightly north before heading east in the direction of Germany. I was lucky that the weather improved with very few rain drops in sight. While still windy, it really made all the difference and I found myself gritting my teeth far less then the previous days. The icing on the cake was listening to the roar of my beast along the paved paths, it could be heard from miles around! I rode through the famous Delter Dykes which literally stop parts of the Netherlands from flooding and found myself passing through a number of grass plains and deep forests. Many of the forests I came across were rather unique in that they were planned, made obvious by the fact that all the trees were in rows! My next stop was to be in Eindhoven where I was to spend a few days with Martha and Theo, a newly wed couple on warmshowers. Unlike last time, I wasn’t desperate to clean my clothes and get dry. It was refreshing to not feel so needy and instead approach my stay as a time to relax and to get to know them and the city. Theo is a man who shoots droplets with lasers for a living. It sounds crazy I know but as I have come to learn, the world is becoming more and more specialised and here is a perfect example. Martha, originally from Wrocław in Poland, is a mechanical engineer and taking dutch classes in the evening. I always thought real hard work and motivation is seen not only in those at the top of a sport or field but also those who can manage multiple conflicting priorities. Despite working long hours, Martha still had the energy to get home and grab a bite to eat before heading straight off to her dutch classes to return very late at night. I was impressed and it made me wonder just how hard I am working in this biker life I have chosen. Food for thought. With Eindhoven in my rear view mirror, it was only a stones throw away to the border with Germany. That sense of progress that I sometimes feel on the bike was very present and I was eager to cross the invisible line into Germany. If I thought the forests in the Netherlands were a pleasant surprise, the forests that were to come in Germany were out of this world! Thick wooded areas blanketed in autumn leaves and smooth flowy tracks to follow. It made me realise just how much I had missed the feeling of racing down tight single track with hardened trees whizzing by. With my new panniers I had my doubts about how well they would survive down the tracks but, touch wood, they have held up just fine. Packing them with the bulkiest, lightest items and most importantly, choosing the smoothest line down the trail, seems to do the trick.